In Luke 16:19-31, we read the story that Jesus told about a certain rich man and a poor man named Lazarus who had lain suffering with hunger and a diseased body just outside of the rich man’s house. Jesus tells us that the rich man ate “sumptuously” while the poor man would have loved to have “the crumbs that fell from the rich man’s table.” Eventually, the rich man died and ended up in Hell. But why? Does Jesus say that he committed some great sin; that he murdered someone; or that he committed adultery; or that he broke some other of the Ten Commandments? It’s easy to surmise that in telling this story Jesus let it be known that the sin of this rich man was living in luxury while ignoring the needs of the suffering poor man who had lain on his front doorstep. Is this not a warning to us that living out an affluent, consumeristic lifestyle, while being indifferent to those who suffer the pains of poverty, is to stand under God’s judgment? The only description that Jesus gives of Judgment Day is found in Matthew 25:31-46. There he declares that to not feed the hungry; clothe the naked; care for the sick; heal the brokenhearted; and reach out to those in prison translates into a rejection of Him as Lord and Savior. This is because Jesus chooses to present Himself to us through the poor and the oppressed so that to reject them is to reject Him. The scriptures clearly teach that if anyone says that he or she loves God, but does not love their neighbor, such a person is a liar (1 John 4:20). This affirms that God wants to be loved through one’s neighbor—and especially through the neighbor who is in need. Signpost International workers take these scriptures seriously and both in Scotland and in foreign countries are responding with love and service to persons in need. They have learned what they hope all of us will learn, that giving to those who suffer is not simply a responsibility, but a privilege. The Apostle Paul taught that to give is to be exercising what he called “a gift of the Holy Spirit.” That is why they never hesitate when they call on fellow Christians to give sacrificially because they know that in doing so Christians are exercising a calling from God that carries with it its own blessings and facilitates the spiritual actualization of those who do the giving. In Haiti there are 250, 000 restaveks. Restaveks are children who have come from families that are so poor that these children are given away to become domestic servants. In reality, they become the closest thing to slaves imaginable. When the earthquake last year destroyed Port-au-Prince, panicked families who had restaveks in their households did everything they could to take care of their own children, but turned out onto the streets the restaveks. These poorest of the poor children had to fend for themselves. Beyond Borders, a sister missionary organization to Signpost International, has been gathering these children into “safe houses” to protect them from human trafficking and to care for them until good homes can be found for them. These children are those whom Jesus called “the least of these, ” and it is such as these that Signpost International is committed to serve and to love into God’s Kingdom. Special Note: I will be speaking on behalf of Signpost International in Scotland on Wednesday, January 26, 2011. Doors open at 7:00 PM for a 7:30 PM start. Location: Dundee’s Caird Hall. For more information click here. 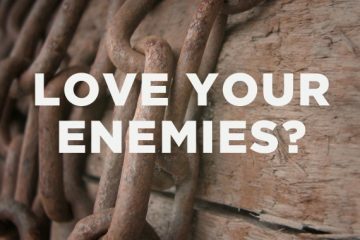 Love Your Enemies …Sort Of?